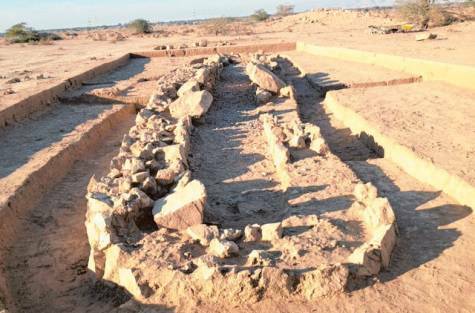 UAE – Ras Al Kaimah - Abu Dhabi: Graves dating back to 2000BC have been unearthed during the construction of the Shaikh Mohammad Bin Zayed Road project in Ras Al Khaimah, Gulf News has learnt. The Sieh Al Herf site, next to Al Salhiya Road, just off Shaikh Mohammad Bin Zayed Road in Ras Al Khaimah, was discovered in October. It contains graves, ancient tombs and archaeological artefacts. The Shaikh Mohammad Bin Zayed project passes by about ten features of the archaeological site, including two graves. The first is an 18m-long horseshoe shape, and the second is W-shaped. Other tombs are still under investigation. “Sieh Al Herf contains several graves and tombs that demonstrate the history of the Arabian Peninsula and date back to the year 2000BC. So far only three such historical graves have been found in the UAE, two in Ras Al Khaimah and another one in Fujairah,” said Hamad Bin Seray, associate professor in the department of history and archaeology at UAE University. 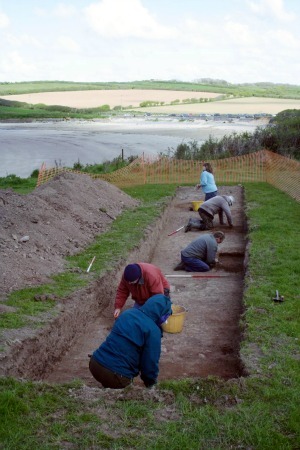 ROYAUME UNI - Pembrokeshire- In St Ishmael, Pembrokeshire, a 16th century village was found buried under sand dunes. “Sand was being deposited on their land and erosion was occurring,” said James Meek, the trust’s field services head. “Over time, because so much sand was building up it became more and more unliveable and people slowly started to move out. They have not left a lot behind so they have obviously not left in a rush. “What has happened is that people moved further up, to Llansaint, which is a nearby settlement.” The buildings may still have been used as fishing huts. “But in a couple of hundred years the dunes had built up,” James said. In the 1890s a storm exposed part of the village near Milford Haven. The stone was plundered. “Local farmers were using it to get stone so it turned into a quarry,” James said. At Angle an old church site has been studied. “On the south side of West Angle Bay we know there is the site of a little chapel. It is probably an early medieval foundation from the 8th or 9th century.” Cliff erosion has led to graves being exposed. Bones have been discovered poking from cliffs. The coastal path runs over the site. “At the moment they are not under threat,” James said. “We don’t want to dig them up if we do not need to.” “There must be at least a hundred [bodies] there, but I couldn’t really say. “But this is not unusual. Chapels were located on cliffs and over bays and probably painted white so they would act as a beacon to sailors.” At St Brides there is a Norman parish church. At Whitesands, near St David’s, there is an ancient Celtic chapel. Also at Whitesands is a site known as the Ram’s Nose. “This guy noticed these stones sticking out of a sand dune there and alerted us,” James said. “We went out and did an excavation with a group of volunteers. “It’s bronze age from about from about 2,300BC to 700BC. It’s a good few thousand years old.” Sea water and erosion meant nothing was left in a grave that was there. “There was nothing surviving. No sign of bones or organic matter.” In Goodwick a shipwreck was discovered by a walker. “The amount of ship wrecks around the coast is amazing” James said. This sloop can only be found when the sea is at its lowest tide and the sand has washed away from it. At Abermawr, between Fishguard and St David’s, the remnants of a Mesolithic hunter-gatherer were discovered. All around Wales are the remnants of ancient submerged forests. Near Cardigan is Cantre’r Gwaelod, a legendary sunken kingdom. Said to have occupied land lying between Ramsey and Bardsey islands, it has been dubbed the Welsh Atlantis. ROYAUME UNI – Pentillie Castle - Human remains, found at a stately home in Cornwall, are thought to be those of the man who built it. Sir James Tillie, who built Pentillie Castle in 1698, instructed his staff to place him in a chair with his pipe when he died. The instructions were followed before he was removed, but no burial information has ever been found. Archaeologists who examined a mausoleum built in 1713, upon his death, said a body had been found in a vault. In his will, Sir James demanded that he should not be buried, but dressed in his best clothes, bound to a stout chair and placed with his books, wine and pipe on Mount Ararat on the estate. Archaeologist Oliver Jessop said: "It would appear that potentially we do have real evidence that the story or the myth actually was true. "In the early 19th Century it has been suggested that the bones were removed to the local churchyard. "I can confirm that that's not the case and there is a body actually still inside the vault." Mr Jessop said the vault was found after archaeologists dug an exploratory hole in the internal floor of the mausoleum and discovered a brick-built roof. Inside it a structure with leather studs and woodwork with handles on it was found, which are thought to be either a chair or coffin. The team had also hoped to find out if Sir James' wife, Elizabeth, was buried with him, but this is yet to be discovered. USA – Fort Bragg - A prehistoric tool dating to 12,000 B.C. and stone slabs from 2,000 years ago are among the latest artifacts found on Fort Bragg. The finds offer a glimpse at what may have taken place in the area before Fort Bragg was established in 1918. The team inventoried 4,500 acres on Fort Bragg to ensure compliance with federal laws, the Army said. The two archaeological discoveries were made in Fort Bragg's training areas. The first included 2,000-year-old slabs of quarried stone that would have been raw material for weapons and other tools. The second was an ancient Clovis point, a thin, fluted projectile that would have been attached to a spear or other tool for cutting. Linda F. Carnes-McNaughton, the installation archaeologist and curator of more than 2,000 historical artifacts that have been found on Fort Bragg, said both finds were made by others. Randy Daniel, a professor of anthropology at East Carolina University, said the Paleo-Indians who inhabited what is now Fort Bragg were a nomadic culture of hunters and gatherers who lived long before agriculture was introduced to the region. They likely hunted mastadons or prehistoric deer and gathered berries and roots, he said. "These people probably represent some of the first people to inhabit North Carolina," he said. "These people live in a time and a place that can only be understood by archaeology." Daniel said he has recorded nearly 300 Clovis point finds in North Carolina. Other archaeological sites on Fort Bragg include an ancient American Indian campsite, a family homestead that dates to the 18th century, and the site of a minor Civil War battle, officials said. EGYPTE – Karnak - At the end of February visitors to Karnak Temples will be able to admire the second chapel of the 18th dynasty Queen Hatshepsut after four years of restoration and reconstruction. 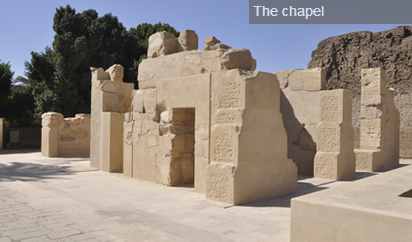 The chapel was constructed in limestone to worship Thebes ancient Egyptian god Amun-Re. It includes an open court and two inner halls embellished with blocks engraved with very distinguished religious scenes depicting Hatshepsut before Amun-Re, with her husband king Thutmose II, as well as their cartouches. Some of the blocks bear the name of Hatshepsut's predecessor king Thutmose III. Minister of State for Antiquities Mohamed Ibrahim said that the majority of blocks of this chapel were found scattered at the beginning of the 20th century in the Karnak courtyard cachette where a collection of gigantic colossi of different New Kingdom kings, queens, nobles and top officials as well as deities were discovered. Another batch of the blocks, Ibrahim added, was found in mid 1950's during excavation works carried out by Sheata Adam and Farid El-Shaboury at the cachette.